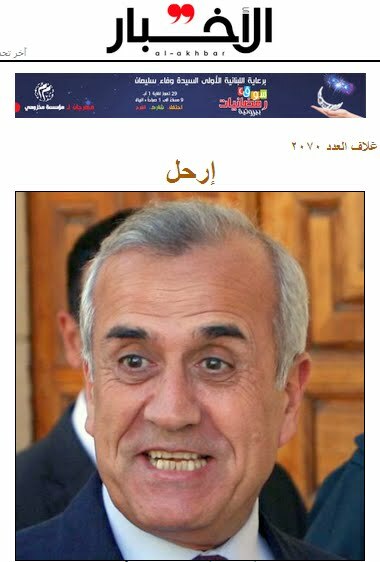 It was addressed to President Michel Sleiman. It marked one of the unique times in Lebanese peacetime that a newspaper tells a sitting President of the Republic to step down. The newspaper is al-Akhbar, Lebanon’s mouthpiece for Hezbollah, Iran and Syria. The author of إرحل is none other than its editor-in-chief Ibrahim al-Amin. Amin slammed the president and told him to quit for doubting the wisdom of Hezbollah’s military involvement in Syria and urging a national defense strategy to end the twofold possession of legal (read Army) and illegal (read Hezbollah) arms. Sleiman was speaking Thursday during celebrations of Lebanon Army Day. Overnight, three rockets slammed into Beirut’s Fayyadiye, Yarze and Baabda districts, all home to presidential and army facilities. Strange is President Michel Sleiman. What’s happening to him? Who’s pushing him? What’s he thinking? What’s he worried about? Who’s his team? Who does he consult? Who thinks for him or on his behalf and whispers to his ear? Who’s he addressing today? Who put in his mind that he is the number one statesman? Who made him believe Lebanon’s salvation can only come through his hands? Who told him his words are sacrosanct? Who put in his head the country lives by his words and by his thoughts? Who put across to him that extending his presidential term is inevitable? Who made him believe he is the eternal commander in chief of the Lebanese Army? Who made him believe he is the trusted master of the country and people? What’s his grasp on facts in the country, the region and the world? Which facts does he gather and how does he discard what needs to be discarded and highlight what needs to be highlighted? What calculations govern his steps when figuring his conduct as President of the Republic? Why his family members’ haughtiness – whether in charities, or by ruling the roost in clubs and municipalities, or in the way they commute back and forth from their homes? Yesterday, President Sleiman expressed a sudden whim. What the president said is that he decided, without us knowing, that the Resistance is putting the country and its people at risk. His Excellency decided yesterday that the Resistance has exceeded its limits – and Lebanon’s limits as well. Discussing with the president his remarks is of no consequence anymore. Discussing anything with him is useless anyway. Debating his or his aides’ brilliant ideas and creative proposals is pointless. …The Syria crisis is having a profound effect on Lebanon. The spillover threatens to disrupt Lebanon's progress toward democracy, independence and prosperity. There are those who would drag Lebanon into the Syrian conflict. Hezbollah is putting its own interests and those of its foreign backers above those of the Lebanese people. Hezbollah’s active military support for the Syrian regime contradicts the Baabda Declaration, violates Lebanon’s disassociation policy and risks Lebanon's stability. My mission, if confirmed, will be to do everything possible to support the Lebanese in their policy of disassociation from the Syrian conflict, help them maintain their sovereignty and ensure that America is helping to meet the humanitarian and economic challenge posed by refugee flows into Lebanon. Violence is already spilling over. The work of the Lebanese Armed Forces and Internal Security Forces to protect Lebanon from these consequences reminds us that U.S. security assistance is a pillar of our bilateral relations and serves U.S. interests. We work with these two institutions to fight common terrorist threats. We have a strong commitment to support the Lebanese as they build-up these institutions so they can project state authority to all corners of Lebanon. Only with such institutions can Lebanon ever attain stability, sovereignty and security. There are over 700,000 refugees from the Syrian conflict in Lebanon, a nation of four million. The strain is great. Our humanitarian aid helps the refugee population as well as Lebanese host communities, many disadvantaged themselves, with food, shelter, healthcare and schooling. If confirmed, I will seek new ways to support Lebanese protection and assistance for those fleeing the terrible violence next door. Labels: al-Akhbar, David Hale, Hezbollah, Ibrahim al-Amin, Iran, Lebanese Army, Lebanese President Michel Suleiman, Lebanon, Michel Sleiman, Syria, U.S.